In order to protect and restore nature we need stronger means. We have to continue this battle to save the world, presenting plans for brighter and more durable millennia. The Museum of Nature is the next step in an ongoing imaginative nature-restoring project, which started in the year 2000 with the Restoration exhibition. The Restoration series was about restoring single nature objects by means of technology and building skills. The museum project takes this one step further. 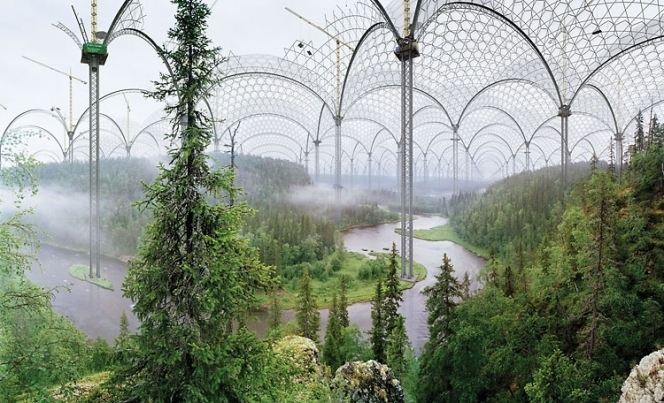 I visualize shelters, massive buildings where big ecosystems could be maintained in their present state. These massive buildings protect forests, lakes, and rivers from pollution and, more importantly, from the actions of man himself. At the same time I study different aspects of man’s relation to nature as a rare unique endangered place. When putting nature into a museum, you have to consider the aspect of the audience | consumer. Nature becomes a joyride for tourists, and a beautiful landscape turns into a meditative theater show. The project is based on a pessimistic vision of what is happening on earth. I look into the future, and I am not very happy about what I see. I consider these pictures more as visual pamphlets than aesthetic images. Digital process is constantly present in the works. I freely combine photographs of landscapes and computer-generated 3 D models. The works are visualized building plans, plans I would rather not see realized.